With the Dios, we really liked the choice of sizes, the look of the kit and hardware and many aspects of the sound. The little hardware niggles were disappointing, but shouldn't put you off - they're easy to check for before you buy. Just as Mapex has come into its own as a 'proper' drum brand, good things could come to ddrum and its players in the near future. Nice looks, cool styling, unique vibe. Couple of little hardware glitches. Over the years, ddrum has worked hard to raise its profile in the traditional drum market, securing itself such endorsees as Trivium's Travis Smith and Megadeth's Shawn Drover. 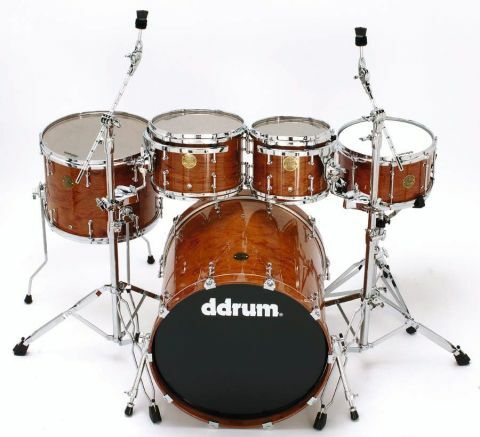 We're now at the point where ddrum acoustic kits are less of a novelty and, with sets like the Dios Bubinga here, the company clearly has its sights set on being taken seriously as a producer of both electronic and acoustic products. When we talk about 'the company', a little clarification is probably needed in order to understand something of where this kit sprang from. Previously owned by Swedish synth maker Clavia (responsible for the massively popular Nord keyboards), the ddrum brand was sold to its US distributor, Armadillo Enterprises in 2005. At the time ddrum was all about triggers and modules, but Armadillo reckoned there was a gap in the market for a new range of ddrum-branded kits; and therefore they went about producing an expansive line that currently starts with the D2 beginner kit and culminates with stuff like Travis's signature outfit and the exotic wood Dios. It was an ambitious and large-scale exercise. The first impression of the Dios Bubinga is one of an interesting mix of sizes, something that's always welcome in our book. Instead of the usual 14"x5½" snare, ddrum opts to furnish the Dios with a 13"x7" snare which partners a hugely deep 22"x20" kick drum and shallow-ish toms of 10"x8", 12"x8" and 16"x13". As such it comes across as a very contemporary set-up - shallow toms for fast response, long bass drum for cannon-like boom and a tight-but-deep snare. The kit also looks fab. The nice grain and honeyed colour of the bubinga wood is set off with a glossy lacquer and we confess to being very partial to the distinctive lugs used on the toms and kick. The 'mini-bridge' design is very cool and, coupled with the die-cast hoops used on the toms (and indeed snare), lays the Dios's 'high-end' stall out in style. There are other 'professional' features aplenty on the Dios too. The undrilled bass drum necessitates the use of cradles to support the smaller toms and these are sufficiently low profile to not spoil the look of the shells while being sturdy enough for the task in hand. And the rest of the supplied hardware is very decent too. Double-braced throughout, the stands are typical of the kind of serious-but-simple stuff that accompanies kits of this standing. There's nothing overly complicated or ground breaking, but cymbal stand tilters allow good positioning possibilities, everything works very smoothly and little touches like the adjustable spikes on the hi-hat stand go to make the metal bits largely easy to live with. We did, however, come across a couple of minor but unwelcome hardware problems during our time with the Dios. The first, and most irritating, was the presence of a couple of binding tuning rods - far from offering the kind of slick adjustment expected on this kind of kit, one or two proved extremely difficult to tension, almost to the point where we thought they might be cross-threaded. When you're trying to set and tune a kit 'just so' this kind of thing, as you'll appreciate, can drive you to distraction. The other, very probably isolated, hiccup was the extending part of the bass drum spur getting stuck in the main shaft. Grabbing the foot and pulling vigorously while jiggling it about a bit had it sorted, but the difficulties arose due to the end section of the leg fouling the clamp when the rubber foot was unscrewed. We can't see that there's a design fault as such, but it's a shame when such glitches conspire against what is basically a very worthy package. Such quibbles aside, let's get back to the shells. Eight plies are used for the snare and bass drum, while six are employed on the toms, and these are arranged in alternating vertical/horizontal laminations. The combined result of such construction and the use of exotic bubinga is a pretty strident, mid-focused tone all round. The natural tonal inclination of the shell suits the 13"x7" snare drum here - the extra depth ensures sufficient beef to each backbeat, while there's a very liberal helping of articulate, crackling 'snap' too. Ghost notes are gratifyingly easy to pull out of this snare too. We also liked the toms, for the same reasons as the snare. The combination of unusual sizing and the bubinga shell makes for drums that are fast-speaking and controlled when subjected to quick stick flurries. These are not toms for Nirvana-style grunge bashing - they're lighter-toned than that - but they'll suit a good deal of other styles very well. Although both ddrum endorsees mentioned earlier are metallers, ddrum also boast a fair few r'n'b types, including Derrick Wright (Toni Braxton) and Jamie Gambel (Jamie Foxx), and the clarity of the Dios tone is something that players like them could very easily get quite excited about. Oddly, we weren't completely blown away by the Dios's 22"x20" kick. Perhaps expectations were too high in the first place, but we found it a little more lightweight than hoped. There wasn't that sense of the tone emanating from something bigger than the shell in question like there so often is with really high-end stuff. Granted, the Dios isn't priced at that kind of level, but that 20" depth had us holding out for something really earth-shattering. As it is, the tone is well balanced and reasonably deep, but it just lacks that extra bit of oomph that we had thought might be forthcoming. Building a drum brand from nothing doesn't happen overnight, and ddrum (or Armadillo Ents) should be applauded for having the guts to try a range of products with a different vibe than mainstream offerings from the big outfits.